Stations: Mounted and Canine Operations, W.A. Memorial at: Interred at the Maylands Police Complex, W.A., with a plaque. It is with great sadness that we share with the public that Police Dog Rumble this afternoon tragically succumbed to his illness. Rumble was as tough as they come, but this battle was too much. It is a tragedy Rumble was unable to enjoy retirement with his handler Mat Muletta and family, which is how we wanted his story to turn out. He will be cremated and his ashes interred at the Maylands Police Complex, with a plaque. 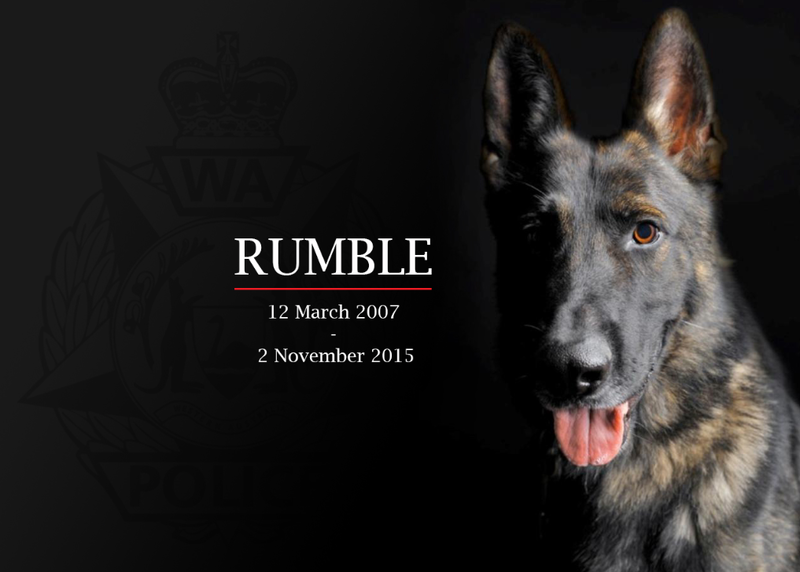 Rumble was one of 40 dogs working for WA Police. All of them are loved and cherished by us, but you would have to say that Rumble was certainly special. He made an exceptional contribution to policing in Western Australia and keeping the community safe. You could say he was loved by the public and loathed by the crooks. Since 2011 he was involved in 620 arrests and in over 200 of those, Rumble single-handedly tracked and located the offenders. Since July this year he had a part in 74 arrests and was directly responsible for 18 of those. Rumble united the WA community throughout his battle and the WA Police was humbled by the overwhelming response to his illness. Today is an extremely sad day, on which we wish ‘Our Boy’ Rumble goodbye. Sincere condolences to the Muletta Family and Mounted and Canine Operations. Thank you to all the staff at the Murdoch Veterinary Hospital who worked tirelessly in this difficult time.